InOut Webmail is an ultimate solution to your email messages and online chat service needs. Create your own mailing service with the help of this professionally built email service. Inout webmail will help you create a hypertable style email/messaging service with a professional layout and all the features you look for. Download Gmail script. Do not download nulled Gmail script from torrents or illegal sites. It's illegal. Always buy scripts from original developers. 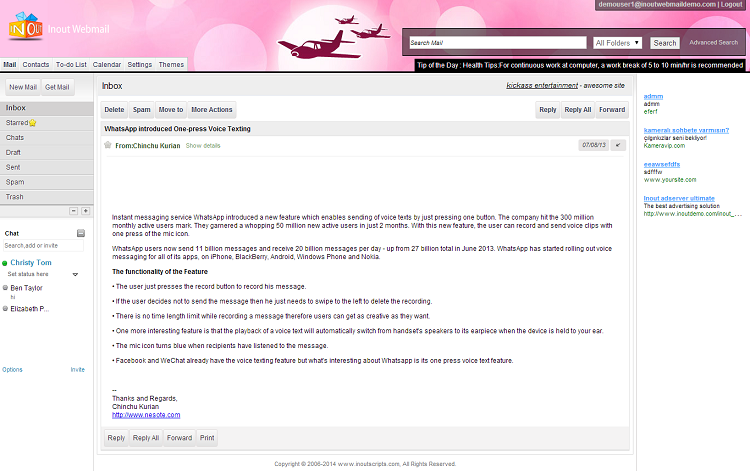 AfterLogic WebMail Lite is a free open source email service for your mail server. Modern, easy to use interface, sending and receiving email messages, storing web contacts and a lot other features come with this free Gmail clone service. Created by AfterLogic, WebMail pro is a professional web based email service that can be easily configured on your servers. Easy to use and install, this professional email service is of high quality and sure to bring quality to your communication. With AtMail you can create contact groups, send and receive messages, add contacts, create calendars and do a lot more that an awesome email service provides.